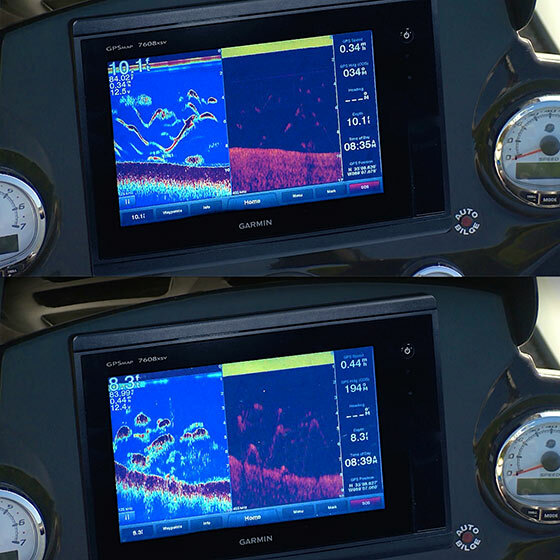 Our Garmin 7608xsv has really been helping us find fish lately. You're looking at a split screen with traditional sonar on the left side and DownVu on the right. Traditional sonar is better for showing objects like fish while DownVu will show you better cover images like a stump, tree top, etc. Here, the top image is showing bass feeding on schools of baitfish. A few minutes later, in the bottom image, I've changed directions and headed back over the top of the baitfish. You can clearly see that they are in the process of schooling back up close to the drop-off where the bass originally ambushed them. Also, you can see the big schools of baitfish on the DownVu and when you check it out on the traditional sonar the image you are seeing is even more defined. This just goes to show...bass don't always feed on the surface...most times it's going on down below and my Garmin graph keeps me in the game longer and with this picture, I usually win this one!